The Sludgelord: The Sludgelord News : THE WOUNDED KINGS: Revolver Magazine Premieres "The Silence"
The Sludgelord News : THE WOUNDED KINGS: Revolver Magazine Premieres "The Silence"
UK doom conjurers, THE WOUNDED KINGS, in association with Revolver Magazine, offer up another taste of bottom-heavy brilliance with "The Silence." The latest canticle comes courtesy of the band's forthcoming new long player, Consolamentum.Dubbed "unspeakably dark" and the "richest listening experience the band has concocted to date from any of its lineups," by popular riff portal The Obelisk, who listed Consolamentum among their most anticipated albums of the year, the record was produced by sound sorcerer Chris Fielding (Electric Wizard, Primordial, Winterfylleth et al). Recorded and mixed in just six days completely live during one of the most scalding weeks of the year in a studio miles away from civilization, the seven expansive tracks that comprise Consolamentum capture a true sentiment of isolation, gloom and looming misfortune. 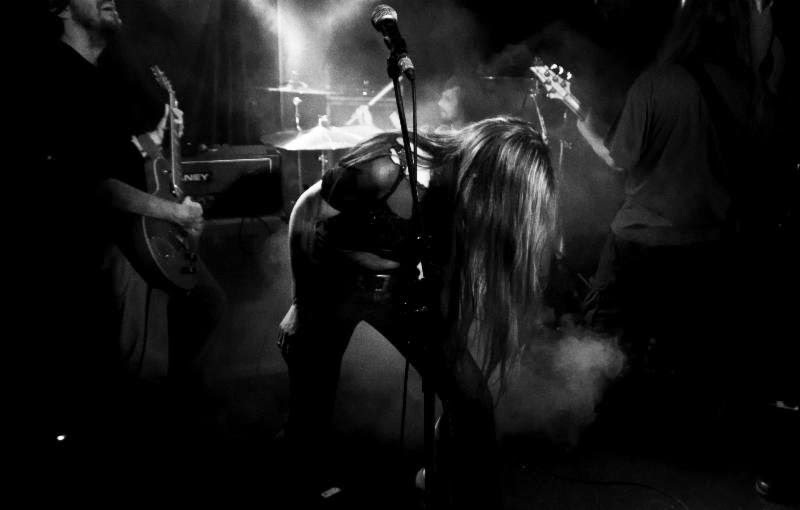 Led by the consuming vocals of front woman Sharie Neyland, who seemingly casts spells with her dark, prophetic words, THE WOUNDED KINGS dispel a singular heaviness that's difficult to dismiss. In a poignant review of the record The Sleeping Shaman fittingly relays, "A dense cloud of ominous riffs floats across the void with subtle, sad melodies slithering through the thick fog. Droning dirges soaked in occult vibrations, guided by the enchanting clear voice of the high priestess of doom, emerge from this cloud. Enraptured and hypnotized I stand, my mouth opened in awe of this colossal monster that is coming to devour me. Yet I refuse to turn and run. I want to be swallowed up in this hungry, monstrous mist and be torn to shreds by the siren in its center." Get down with your sinister self with "The Silence," now playing at Revolver at THIS LOCATION. And if you missed it, you can still check out the the title track, currently streaming at Vice/Noisey HERE. Overcoming numerous lineup shifts since their formation in 2005, THE WOUNDED KINGS - Neyland, guitarist/keyboardist Steve Mills, guitarist Alex Kearney, bassist Al Eliadis, and drummer Myke Heath - have continually stunned audiences with their commanding stage personae. The two-time Roadburn alumni are adored by attendees and popular festival promoters, who call the band, "British doom of staggering power that is made all the more distinct by the unsettling presence of singer Sharie Neyland, who stands on stage almost trance-like, invoking her lyrics in a chanted voice that holds the entire venue in thrall." To date, the Dartmoor-based five piece has released three full-length studio albums and a well-received split album with Richmond, Virginia's Cough. The band has been finding a growing American audience since the release of 2011's In The Chapel Of The Black Hand, the first offering to feature Neyland. Consolamentum will be released in North America via Candlelight Records February 25, 2014. Digital preorders are currently available via iTunes HERE.